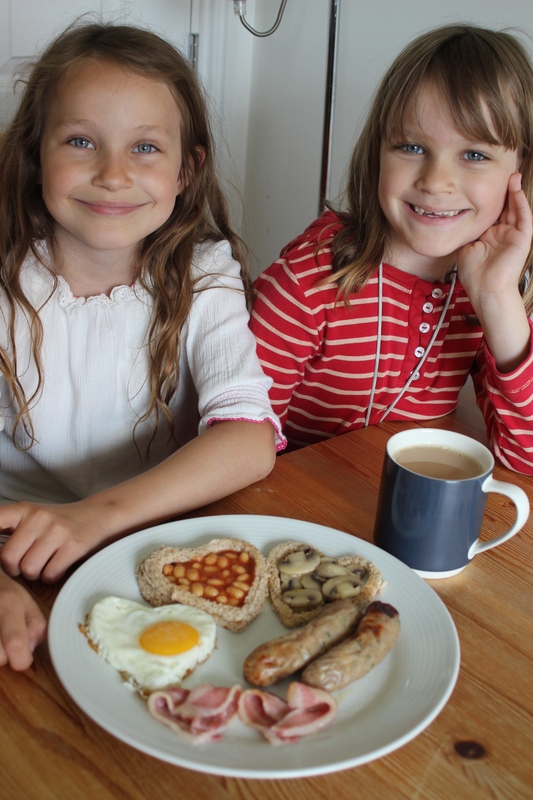 For their ‘Father’s Day Breakfast In Bed’, Mook & Lulu served Pork and Herb sausages, Bacon Hearts, a Heart-Shaped Fried Egg, and baked beans and sauteed mushrooms in heart-shaped toast rings – but of course you can switch it to make your own perfect ‘Father’s Day Breakfast’. Preheat the oven to 190 degrees and put the sausages in a baking dish to cook in the oven – for about 25 minutes. Meanwhile, make your Bacon Hearts. After a few attempts at these, we found that the bacon hearts work best if you cut a single rasher of streaky bacon into two and fold the two halves into a heart shape on the baking tray. These are a little fiddly, but keep re-arranging them until you’ve got a heart shape that you’re happy with. When you’ve made all your hearts bake them in an oven, preheated to 190 degrees for about 9 minutes – longer if crispy bacon is preferred. While the bacon and sausages are cooking, slice your mushrooms and saute them in a little butter, in a small pan over a low heat. If you cover them with a lid, you can leave them to gently sweat, just stirring them occasionally. 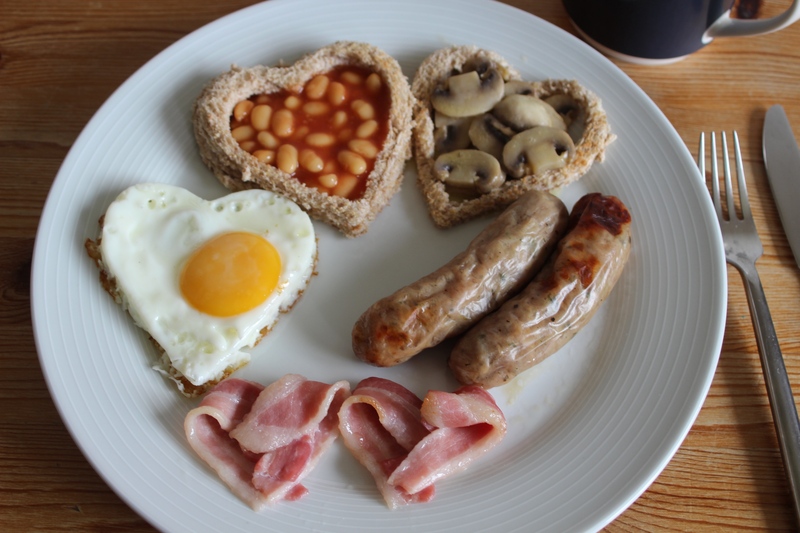 Put the baked beans into a pan over a very low heat to gently warm through while you make the Heart-shaped toast rings. Toast your bread and leave it to cool for a minute or so. Place one slice of toast on your breadboard, and using the smaller heart-shaped cutter place it in the centre of the toast, ensuring you have enough room for the larger to cutter to fit outside it. Press through the toast with the smaller cutter and remove the heart shape from the middle. Line up the larger cutter and press through the toast. Peel the toast away from the outside of the larger cutter. The toast rings are quite delicate, so take your time. Repeat this for all your slices of toast. By now, the sausages, bacon and mushrooms should be cooked, and the baked beans warmed through and ready to go, so time to fry your egg. Heat the oil in the frying pan over a moderate heat. 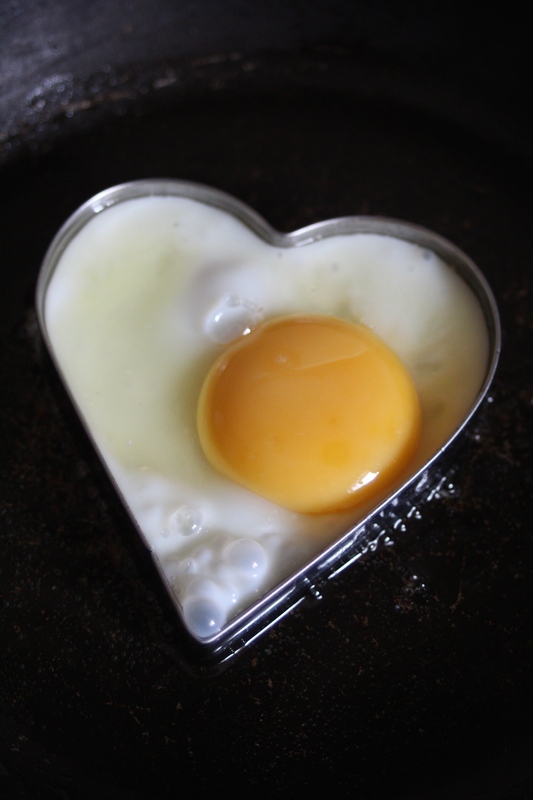 Place your cutter or egg ring in the pan and crack the egg inside the heart shape. As the egg cooks you will need to spoon some of the oil over the top to cook the yolk of the egg. Cook to your preference. If some of the egg leaks from under the cutter or egg ring, trim these bits off when the egg is cooked, before removing the egg from the cutter. Lift the fried egg out from the pan, and use a sharp knife to run around inside the metal ring to carefully release the egg. Brew a cup of soothing tea, or make a steaming mug of coffee (for Dad! ), plate up, and serve on a tray, with as much whooping and hollering as you think Dad can take first thing in the morning. Let us know how you get on with your Father’s Day Breakfast in Bed.